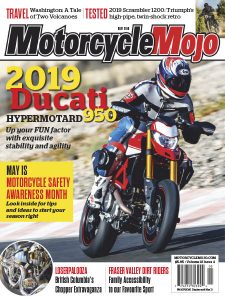 Motorcycle Mojo - 05.2019 » Download PDF magazines - Magazines Commumity! Motorcycle Mojo Magazine has a primary focus on bringing our readership compelling and informative, family oriented articles on interesting people, great places to travel, history and new products on the market. Our trusted and respected product reviews quickly made Motorcycle Mojo a favourite resource for all motorcycle enthusiasts.